Why do we line clothes? Zede caveat: you may line clothes for any of these reasons, all of these reasons, or just some of these reasons. Zede says couture clothes are always lined because it’s the nicest way to finish a garment. Lining a garment gives a better look, will hang better on the body, and there are no raw edges or finished seams showing. You can line garments to keep outer fabric from touching the skin, it can help with perspiration and keeping the outer fabric cleaner. Linings are meant to help garments glide over the body better. If your outer garment fabric is wool, something scratchy, or an unpleasant texture; linings can be a barrier. Linings maintain the shape of a garment. For example wool pants are often lined with a tighter woven more stable fabric so when you bend up and down the knees won’t get baggy and you won’t end up with saggy rear pants fabric. Linings can be used to make fabrics more opaque, used to add warmth or to add coolness (more breathability) and comfort to garments. Zede loves lining heavy polyester bridal/formal dresses with a very light woven cotton fabric. The cotton fabric feels better against the skin than the polyester and is more breathable. Linings may also eliminate the need for facings or slips. You also don’t need to fully line a garment, Zede sometimes omits linings on sleeves. Many times you pick outer fabric based on pattern, texture, water repellency, etc… You can also pick lining fabric for certain characteristics too. For example you may choose cotton for it’s coolness, polyester for it’s slickness or maybe you are wanting something luxurious and go for a silk fabric. You of course can line just for fashion as well. You can find lining fabric at brick and mortar fabric stores or online. They are usually in their own section labeled “linings”. Most of the fabrics found in the lining section are polyester, some may be 100% silk and others marked as china silk are polyester as well. Don’t forget to pre-treat your linings as you plan on treating the finished garment. You will want to pre-shrink cotton for sure. Mallory thinks of lining fabric as a thin tightly woven fabric. Generally this fabric does not add weight or bulk to the garment and most of the time it is kind of slick and acts as an undergarment. Linings are not common in garments made of knit fabrics but can usually be found in outerwear like jackets and coats. This type of lining is accomplished by taking two pieces of fabric, your outer and inner (closest to the body/lining) and treat them as one piece. You will place them wrong sides together and keep them sandwiched together from the start (cutting) to the finishing of the garment. The garment seams will have 4 layers of fabric instead of 2. The garment edges can be finished in numerous ways. This technique was recommended in a cape pattern Mallory made. Most of the cape pattern was not lined but the wings that covered her arms were. She opted to not flat line these pieces but instead sew the two pieces right sides together and turned them out. She did this for fashion purposes and because she found this a simpler process than having to bind the edges. Facings finish raw edges of garments such as necklines, arm holes, and can be used instead of a waistband. Facings are shorter pieces of fabric generally 1.5″-4 or 5 inches. that are sewn right side together to neck edges, etc… and are trimmed, under stitched, and turned to the inside of the garment. Facings are usually tacked down at the seam lines so they stay in place. Facings are used to finish edges, can give structure and add stiffness to edges. Facings may be interfaced (per pattern recommendation) with a number of different interfacing products. 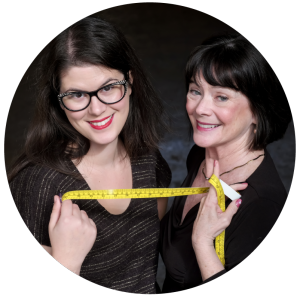 Zede and Mallory prefer to use cotton organdy or horsehair when interfacing is recommended but that’s another podcast – found here. Zede notes that couture garments are seldom faced and usually always lined if it’s a woven garment. This episode of Sewing Out Loud is brought to you by The Confident Stitch. Based in Missoula Montana, the Confident Stitch is your dream local sewing store. Lucky for us they have a fabulous user friendly website with over 1000 fabrics to choose from and a wide array of indie patterns that you don’t have to tape together. 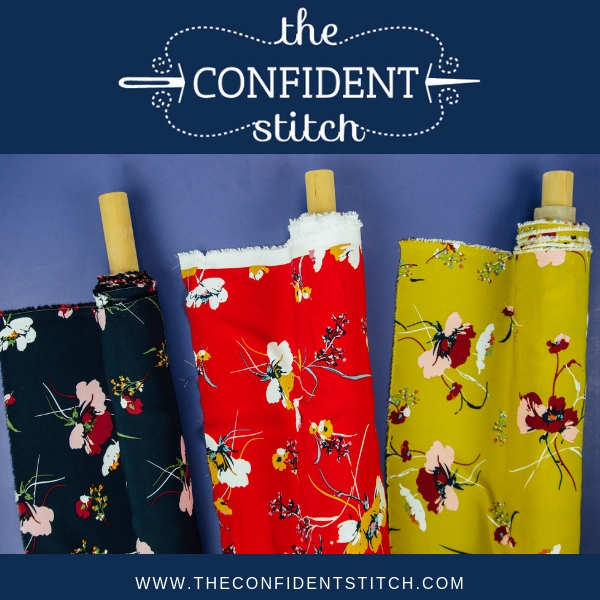 Rayon fabrics at the the Confident Stitch are 15% off during the month of December 2018, no code necessary. Just visit SewHere.com/confident to browse their selection. Rayons are perfect for Easy T’s, scarfs, flowy dresses, and tops or even linings. The range of prints is absolutely mouthwatering. They even have the Cotton and Steel Rifle Paper Company rose prints that are in such high demand. 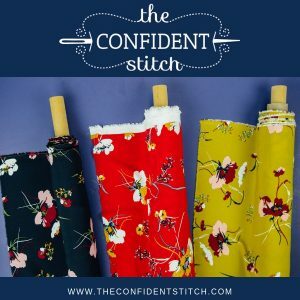 Visit SewHere.com/confident to discover the local sewing store of your dreams and save 15% off rayon fabrics during the month of December 2018. Zede says sometimes facings can be incorporated into the lining. A pattern may call for facings and if you are experienced enough with the rules of facings and linings you can skip facing the garment and just line it. The lining will be substituted as a facing. A bag lining is larger than outer garment fabric and will generally have added ease the outer garment fabric does not have. Bag linings are seen in jackets a lot of times. The reason for bagged linings is to provide ease in a woven lining. For example, a jacket may have a pleat or two across the back at the neckline and this allows your back to move and stretch without ripping the lining. The lining expands at the pleats to accommodate your body’s movements. The hem of jackets is another place you will notice a bagged lining. The lining will come down to the hem and be folded up before its sewn into the garment leaving extra lining fabric at the hem to raise your arms up and move freely without having the hem extend past the outer jacket fabric. Mallory notes that linings can be intimidating because there can be lots going on and extra finishing steps to complete. Zede agrees and also adds that lining directions can also vary from pattern maker and ready to wear garments. Can you muslin a garment without it’s lining? Zede does, and says this is because a lining should not add bulk. 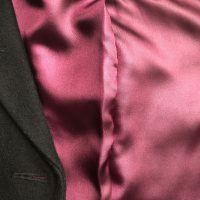 It should be lightweight and not impact the fit which is why the fabrics in the lining section are thin polyester usually, but a rayon or silk may be used. Zede buys fabrics appropriate to use as linings in patterns and colors she likes but these seldom come from the “lining” section. The fabrics may look scarf like and be polyester garment fabric. She also likes to line polyester garments that can be hot and not very breathable with light weight cottons. Should you break the rules and use non traditional lining fabrics? Zede says she’s able to do this because she understands and has enough experience with why and how linings are used. She understands how they function and the rules of lining garments. Zede emphasizes, be sure you understand the rules before you break them. When lining for warmth these fabrics are probably not thin and slick but more bulky like a sherpa or shearling type fabric. Mallory would be tempted to muslin these bulkier linings. Zede would muslin the lining only and not the outer fabric deepening on the garment. You may not want a super bulky lining either. Sherpa in jeans would probably not work out too well. Flannel is great to line pants or add a bit of warmth to jackets. In fact Zede remembers flannel lined denim being really popular when she was a kid. These lined jeans where usually flat lined treated. Zede and Mallory agree sewing for warmth is it’s own podcast so stay tuned for a future episode on that. If you have more specific lining questions let us know in the comments.